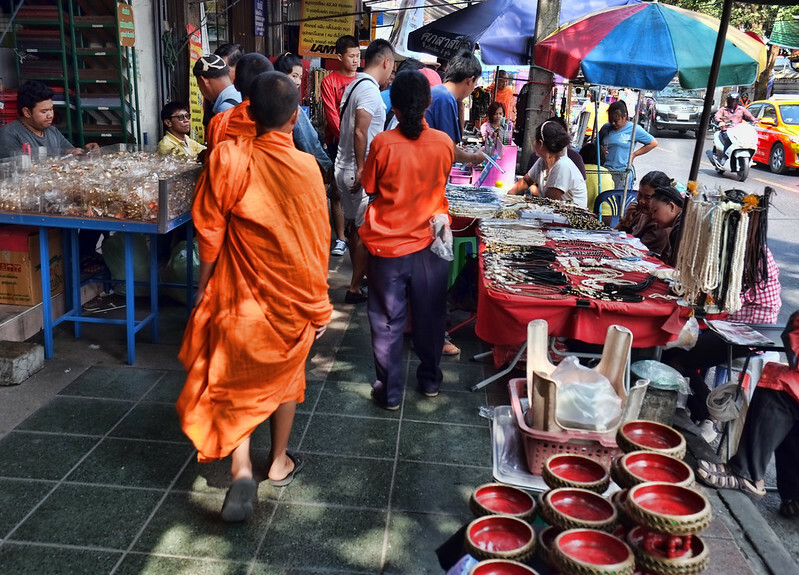 Join me this Travel Photo Thursday (week 207) as we enjoy the Bangkok’s Amulet Market and all that it has to offer. Few tourists leave “The City of Angels” (aka Bangkok) without spending at least a few hours in the “Old City.” If you’re checking out a map, you may not find “Old City.” Instead, look for the area called Rattanakosin located close to the Chayo Phraya River. Here you’ll find the Grand Palace, Wat Pho (famous for its Emerald Buddha, numerous other temples, and a few museums. I’ve visited this area several times over the years, and have taken in the sights. This week I visited again with a different destination in mind, and that was the Amulet Market. 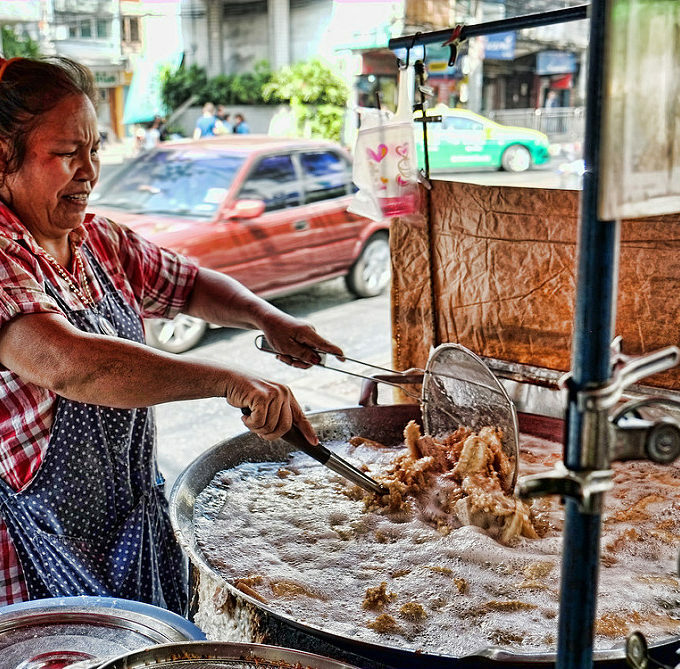 Although the market lies only steps away from the Grand Palace and Wat Pho, many visitors never give it a second glance. 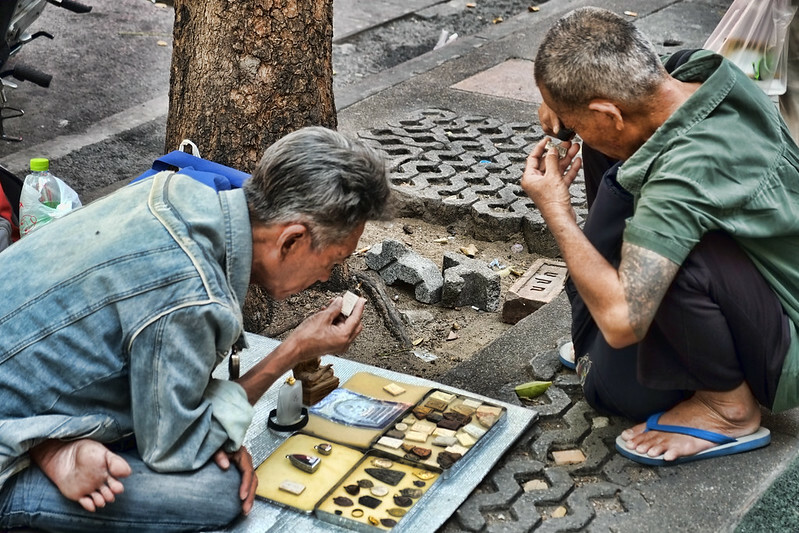 You’ll see evidence of Bangkok’s Amulet Market as soon as you turn onto Maharat Road. The easiest way to get to here is to take the BTS to Saphan Taksin, then head to the Central Pier (2-minute walk and loads of signs). Hop a boat to Tha Chang Pier, and, once there, walk through the outdoor market. If you’re like me, you might have to stop for fried bananas for some added energy! Turn left at the first street (Maharat Road), and you’ll immediately see evidence of the market on the sidewalk. On the left-hand side of the road are the amulet sellers. On the right-hand side, you’ll find a plethora of traditional medicines on offer. The stalls are basic with a table or two, and some stools. Some merchants even display their wares at ground level. You’ll find amulets of every shape and size. 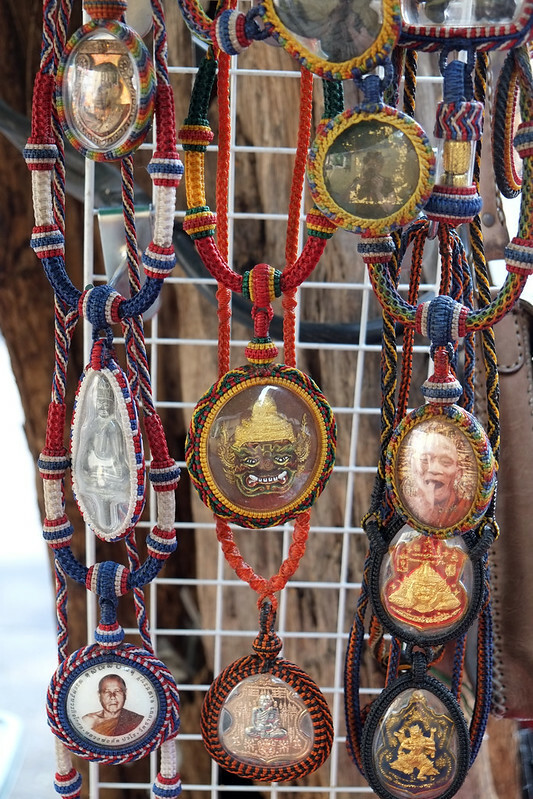 Prices start at 20 Baht and purchased for any type of protection, from general good luck to financial prosperity. Let your imagination run wild! Some of the faithful want their amulets housed in custom-made Amulet holders. 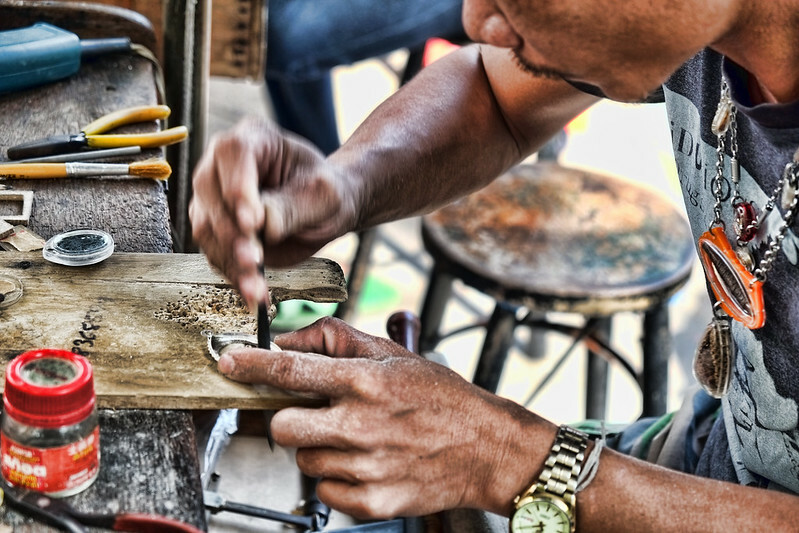 This artist was busy at work carving a beautiful holder from sterling silver. He was happy to pose for me. You will notice a lot of (mostly men) examining the amulets with magnifying loupes. I have no idea what they are looking for, and how they decide if a particular charm has value or not. However, it looks like serious business! Amulets were hanging from trees. 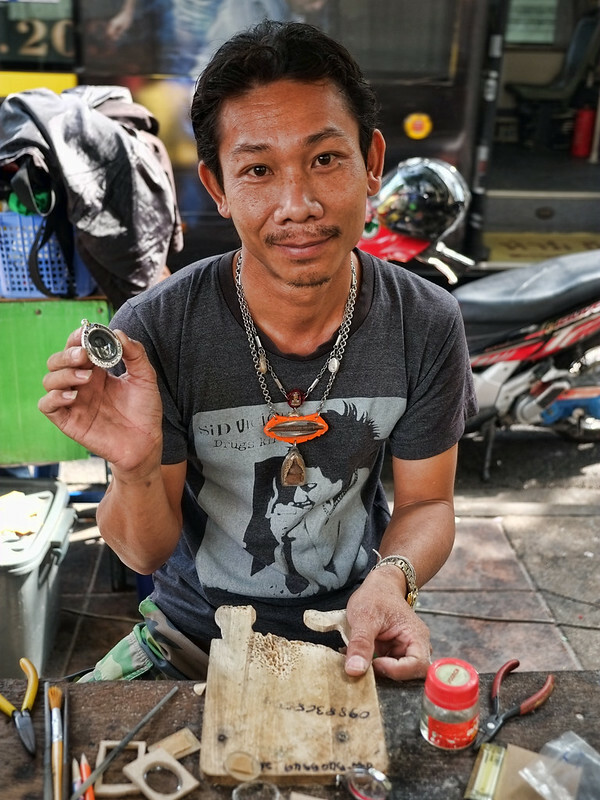 Bangkok’s Amulet Market extends beyond the main road. Be sure to wander down the smaller streets. 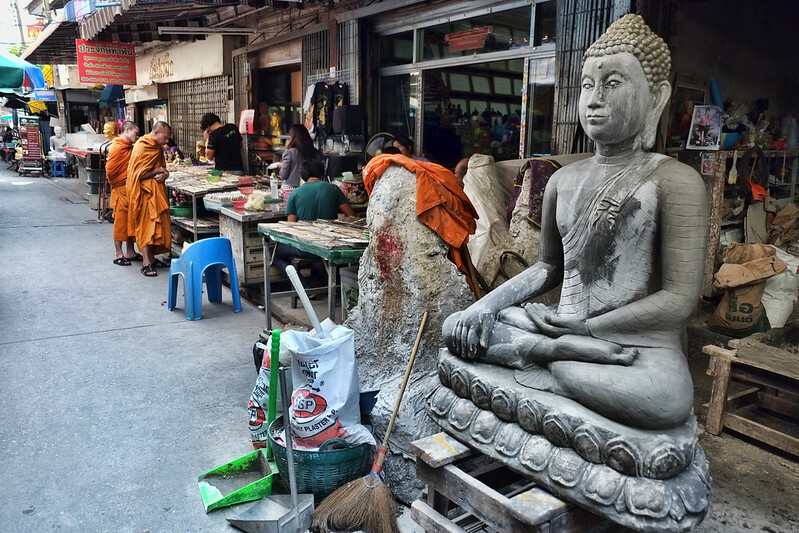 You’ll not only find more amulets but shops producing and selling statues (mostly Buddha). Be careful taking photos around these particular shopkeepers. I was chased off for taking this shot. Then when you think that the market has ended, you’ll find that there is a huge market building that extends to the river. Here you will find, of course, more amulets, plus other jewelry and souvenir type items. If you’re in the market for small Buddha statues, this is the place. The shop owners here are very friendly and were happy to pose in their rabbit ears. And finally, for something entirely different; how about a new set of dentures! The market is open daily, beginning around 9 am and closing up around 5 pm. Sunday is the busiest day. I was there on a Monday, and it was plenty busy for me. Be prepared to spend a few hours wondering around. The area is changing. About a block inside the market you’ll find a new shopping complex. Starbucks has the prime spot, where you can sip your coffee near the water. Be sure to use the facilities here. You’ll find fantastic restrooms with toilet paper and soap! When you’ve finished your amulet shopping, you can cross the street and check out the traditional medicines on offer. You can even take a break from the hustle and bustle at the temple. That’s a post for another day. 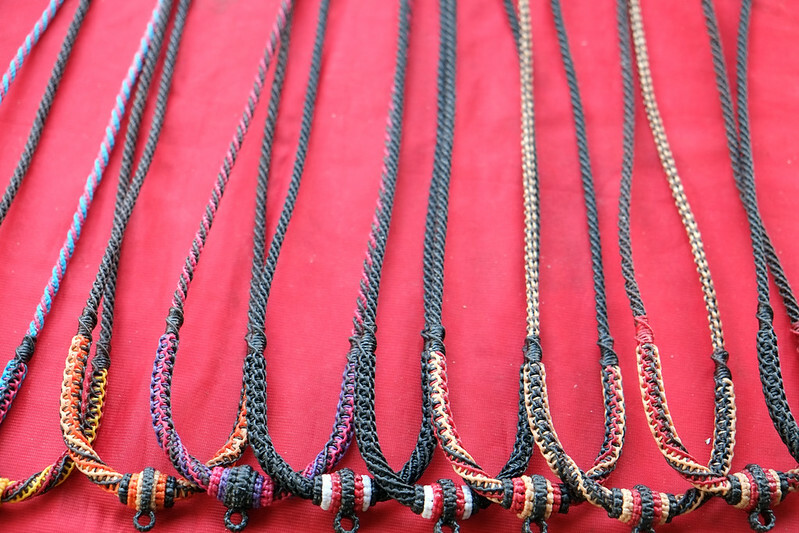 Have you been to Bangkok’s Amulet Market? Did you buy some protection? This is the 207th edition of Travel Photo Thursday. You can browse the archives here. 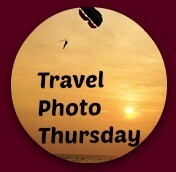 We have a new badge for Travel Photo Thursday. If you’d like to add it to your Travel Photo Thursday post you can grab the code from the sidebar. Linking up to Weekend Travel Inspiration this week (Feb. 6/2017) over at Reflections Enroute. I’ve been to both the Grand Temple and Wat Pho but never the Amulet market. I’m amazed that it’s so extensive, especially since it’s not targeted at tourists. There must be a lot of demand for protection. I think with all those fascinating choices, I’d end up choosing amulets based on appearance rather than protection value. The rabbit ears (in December?) and the dentures are hilarious. Hi Michele. I was surprised at how large it is as well. I’ve spent time in this area in the past, but really was not aware of the amulets. I would be with you in deciding what kind of protection I need. It would be based entirely on how much I liked the amulet! Warmest greetings for the holidays to you and your loved ones! Hard to believe that the amulet market is off the tourist radar — what a cool place to visit. Love the amulets and pics. Hi Cathy. Yes, surprised me as wall. I have spent a lot of time in this area over the years, and it was never on my radar until I stumbled on a couple of posts about it, and decided that it would probably be a great place to visit. I was not disappointed. I have never seen nor heard of amulets, but love the idea of wearing them for protection. When I eventually get to Bangkok I will have to check these markets out. Best wishes for the Christmas season. We were in the area in 2010 and I do think we walked through this market, but that was preblog and I don’t think I photographed it  I love your photos Nancie. An amulet market is such an interesting concept. Have a wonderful Christmas Nancie. 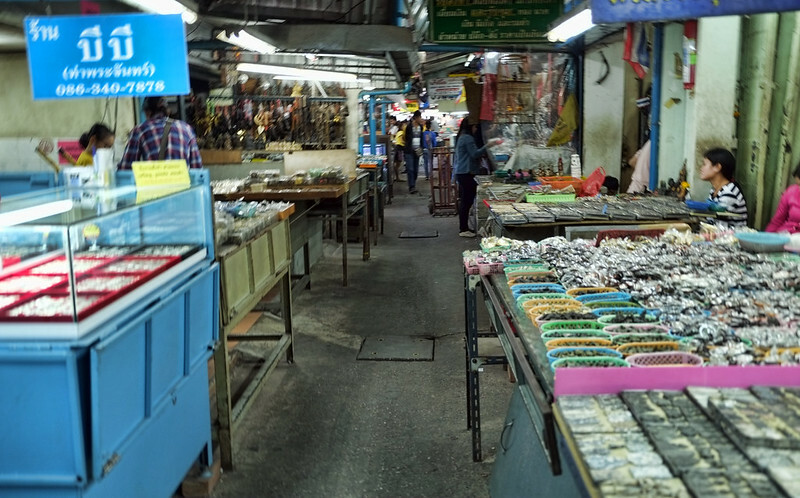 I don’t recall hearing about the Amulet Market the previous times I’ve been to Bangkok but thanks to your blog it’s now top of my list for my next visit! Beautiful photos Nancie and what treasures you found. Sorry I have been absent of late but internet is fragile and sharing a computer at a café doesn’t leave much time for blogging. Hi to all my blogger buddies though!! Happy New Year!! Beautiful photos! I adore Bangkok but haven’t explored the city enough. It seems you found a real cultural side to it! Thanks so much for posting! The Amulet Market looks like a great place to visit. I love your photos. I think I too would have had a hard time figuring out what protection I needed when choosing amulets. 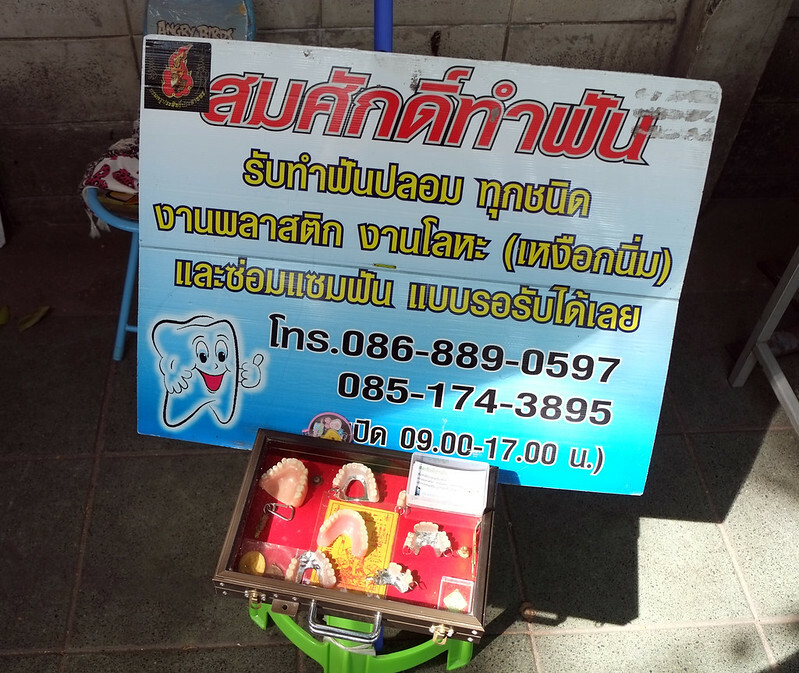 We love markets and have visited many of them in many places, but can safely say we have never, ever seen dentures at one. Can’t say I ever thought we would either. Wow! I’ve never been to this market but it looks interesting. The men do indeed look very serious about the endeavor! I confess to not being a fan of Bangkok but am happy to enjoy it through your eyes and words! I wonder if there would be an amulet to protect one’s teeth from having to purchase those dentures? Seriously, though, this looks like a fascinating stop. I love the orange robes on the monks in your photos. I was going to scoff at the notion that you might have to ponder which protections you need most before purchasing your amulets, but the truth is, whenever I fly, I wear the gold chain from my grandfather’s 1922 pocket watch. That’s pretty much the definition of an amulet. I totally missed this market when I visited the area of Bangkok you describe. It’s hard to believe that there is enough business to support all those amulet sellers and I HOPE no one is selling rhinoceros horn as a traditional medicine. What an interesting market and fascinating tradition ! I\’ve seen amulet markets in Mexico but the craftsmanship is nothing like what you\’ve captured in Thailand. I\’d love to browse those stall and learn even more. wow, how do you choose with so many places and vendors to see, it looks like an amazing place to explore and find some treasures for sure! Wonderful market photos. Love the vivid images of the people. I’m looking forward to visiting Thailand (maybe 2015?) and this post has me ready to go! The amulet market must be filled with incredible sights and sounds, smells and (overwhelming?) activity. And what bargain prices to be able to purchase a portable prize to ward off bad luck, buy protection and maybe provide a dose of good luck too! I have only been to Bangkok once and didn’t get to the market. If I ever have the privilege of returning, I certainly will. I really enjoyed your post and your excellent photos and tips!! Great post. The amulet are amazing and the beauty of them is that they are hand made. Amazing. 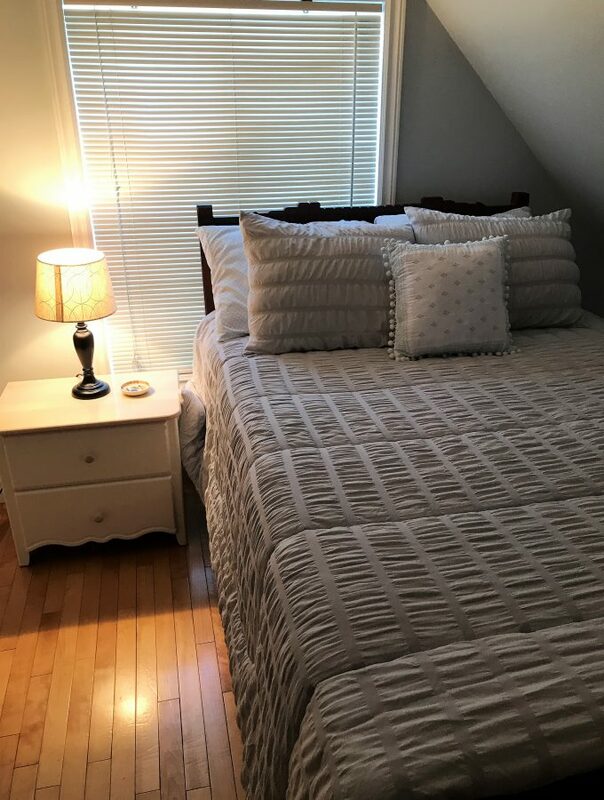 Thank you for sharing this with us. How cool! Such a unique market, unlike any we have seen. Yes, it is, and one that seems to be overlooked by the masses. I’m surprised that more people are not aware of it, being in the vicinity of some major temples. What a discovery! I will definitely look for this when I return to Bangkok. Great pictures. 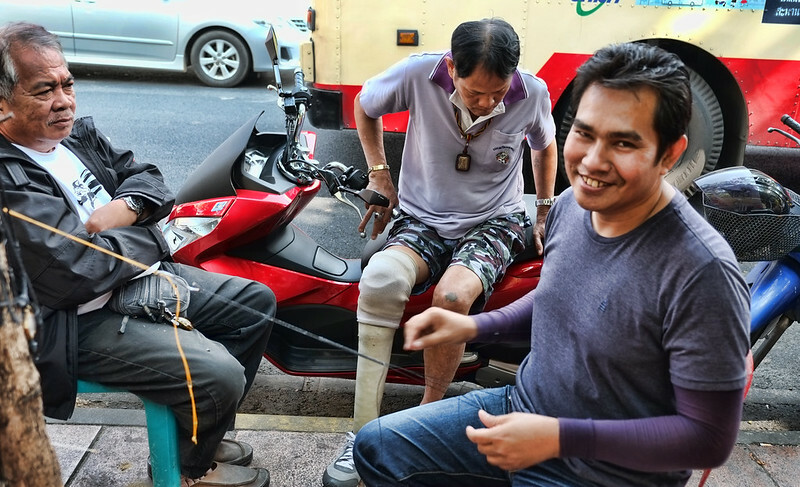 So love the Thai people and wish I could sit as they do in that crouch for hours! Hi Elaine. Thank you, and I do hope you have the time to visit the market when you’re in Bangkok. The Koreans also sit in that crouch. I could never do it! 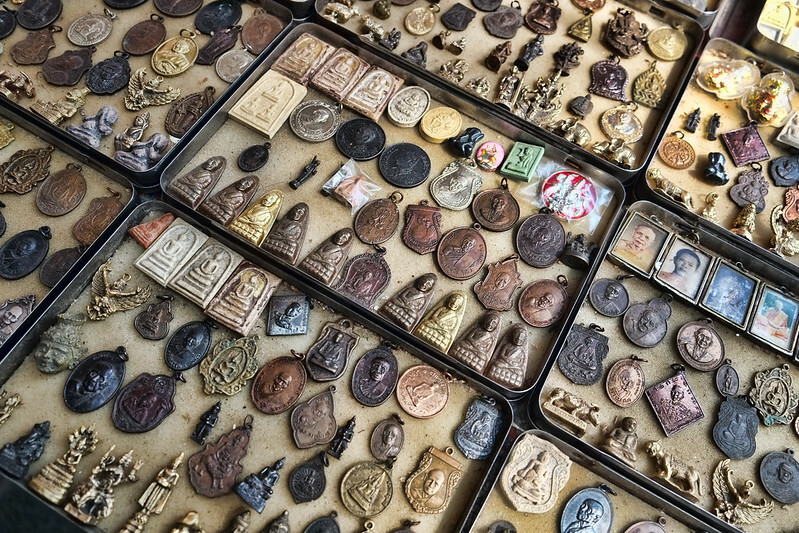 Bangkok’s amulet market looks like a spot I could spend hours exploring! And it would be so tough to decide which amulet to get. Great gift idea for friends and family back home too. Hi Michele. You could be there for a long time. There are just so many amulets to choose from. I agree, they are great gift ideas. You’ve found a very interesting market. It’s large enough to spend some serious time searching for the right amulet.